Members can connect to our special group on FaceBook. 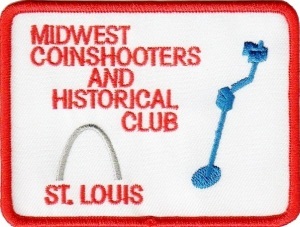 Welcome to the Midwest Coinshooters and Historical Club website. It is hoped that your visit to our site is an enjoyable one. Whether you are a long time and knowledgeable detectorist with years of experience in the hobby or just a beginner who may or may not even have a metal detector of your own, the fact that you are looking at our website is an indication that you have an interest in the wonderful and exciting hobby of metal detecting. Our club is located in the St. Louis, Missouri area, has been in existence since 1980, has about one hundred active members, holds monthly club meetings and group hunts, and we all share a common interest of pursuing our interest in learning about history and finding various treasures through the use of metal detectors. This site will inform you of our club activities, provide our club newsletter, list our scheduled events, answer many of those questions that both experienced and beginner detectorists may have, and provide links to various metal detecting websites including clubs, equipment manufacturers, treasure magazines, and other useful metal detecting related and informative websites. You will find photos from our Annual Fall Hunt, there are interesting articles of some of our members’ recent finds, and you will find information as to how to become a member of our club, receive one of the club patches shown above, receive the monthly newsletter, and be able to join us at our meetings and club hunts. Our club is a self-supported club with a minimal annual dues payment and is supported in its various activities such as the annual Fall Hunt by manufacturers such as Garrett Metal Detectors and detector equipment distributor Kellyco Metal Detectors. Enjoy your visit and it is hoped that when you leave our site that you are more informed about our club and some of the questions that you may have had about the great hobby of metal detecting have been answered.